All I want for my Christmas under the tech-inspired tree of my dreams is a flat screen TV and recliner to further enhance my gaming experience at home. This is a gamers’ dream come true and any guy would agree too that these are must-have objects to complete their man-cave–or woman-cave in my situation. Check out the selection of ideas available at Wal-mart for gifting to others and to keep for your own enjoyment. By placing an order before December 19th 2012, it can be received before Christmas. As an added bonus, shipping is free on most online items. Why, hello there Philips 50″ LCD TV of my dreams. Featured on the left, this bad boy of TVs delivers HD quality in 1080p clarity. Imagine playing your favorite game or watching your favorite movie on this TV! Want to see the best gift around? Feast your eyes on this Xbox360 Bundle for $249. December is always the best time to buy a gaming system because of their bundling with amazing games or accessories at a crazy low price. This one comes with an upped hard-drive–basic one is 4GB– along with two video games, one of them being Elder Scrolls V: Skyrim which is $59 all on it’s own. This truly is the best price you can get for the bundle and it shouldn’t be missed. 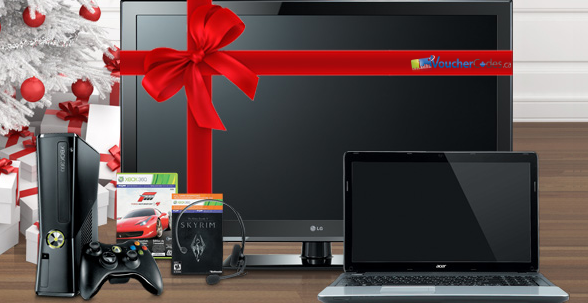 What are you getting the man/gamer/tech fiend in your life? Love the Xbox bundle idea. Great idea. I love the idea as well! I have an Xbox360 at home and the machine alone cost me almost the price of the bundle. It’s a great steal and Skyrim is an amazing game.